We have talked about the basic pizza recipe where you simply place the toppings on the flat dough and pop it in the oven, straight forward and easy! On this page, we will talk about the moist Gooey Cheese Pizza recipe, just like you get in Pizza restaurants. All these ingredients can be purchased from supermarkets all over the world. If you are in Nigeria, look for them in big department stores like Shoprite, Spar etc. 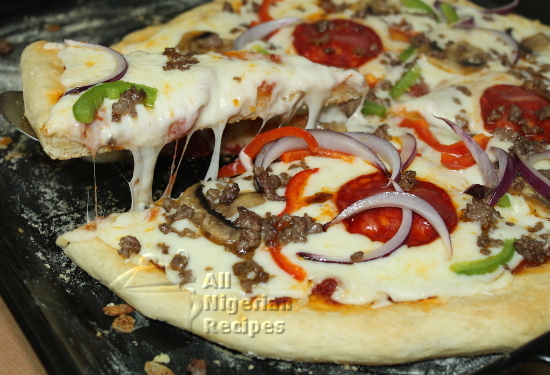 Feel free to use a combination of fruits, vegetables and meat that catches your fancy for the toppings. Mozzarella cheese and tomato sauce are the only standard cheese toppings. Rub some olive oil all over the dough. Bake in a preheated oven at 180°C (360F) for 20 minutes or till the pizza crust starts to brown. Bring it out from the oven, rub more olive oil all over it. Spread the tomato sauce on the pizza crust. Then the grated cheese, making sure the cheese covers all the tomato sauce. Put it back in the oven for 10 minutes or till the cheese has been liquefied by heat. Bring it out again and add the rest of the toppings. Put it back in the oven for a maximum of 5 minutes so that the vegetables will not become dull.